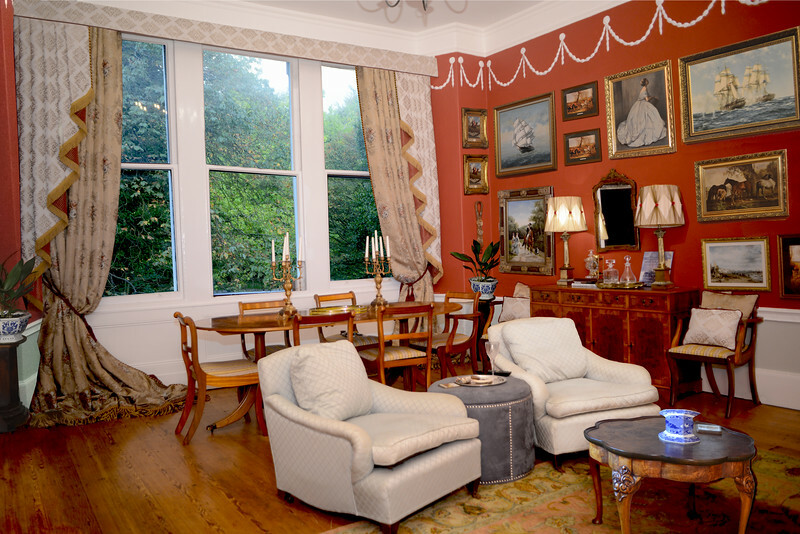 Traditional English style in an Early Victorian Home in Liverpool. 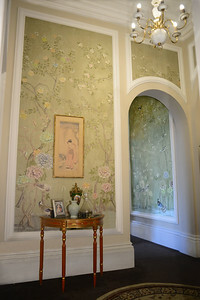 The hall: We did a good deal of searching around and eventually landed on this Lovely chinoiserie Mural which would have been popular in the period this home was built, and used a large graphics made up of this antique mural and reprinted it to align to the original panelling in the hall. Taking care not to reuse the same parts and to place each feature of the mural so it would be centrally placed, not cropped in an unfortuane way. 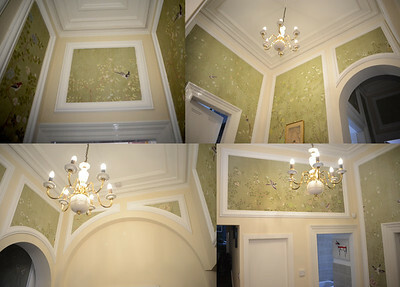 We wanted to make sure that to highlight the best details of the murals especially the exotic birds and fauna of the orient featured through this lovely Chinoiserie mural! The Office also has wall panels that reach right through the entire field space with no dado and I wanted something that would emphasise the cut corners on the panels while giving the room more depth as it is a bit narrow, with high ceilings for such a room. 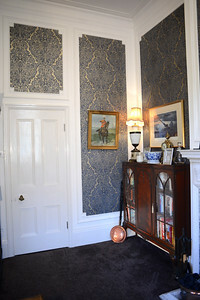 So I found this wallpaper that replicated an embossed velvety look with a metallic antique gold sheen on the "deeper" parts of the wallpaper design which has worked well to give a feel of texture and depth to the spaces within the panels making the room cosy and comfortable while still formal and elegant! 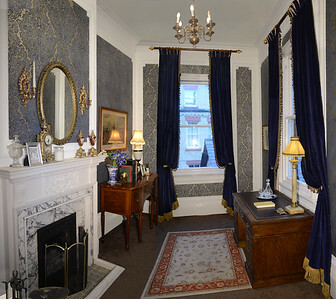 the Blue velvety curtains were matched to the velvety blue texture on the wallpaper and the bullion fringe and tassel trims were also matched to the wallpapers antique gold. we have a turned custom make the pole and finials which Julian then gold leaf and aged/distressed. 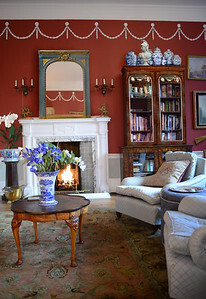 Traditional English Style in an early Victorian Home. Also visit Maison e Maison-Unique rental properties.